Outdoors, there are two terraces, a jai alai court, and an expansive lawn that blends into the surrounding countryside. The two-tiered heated swimming pool (25 x 4.5m, 1.65 deep) is flanked by two wooden decks, and there are plenty of places to sunbathe while enjoying panoramic views of the Pyrenées. The small pool is 5 x 5m. There is also a barbecue at the property, and a 3 car garage. 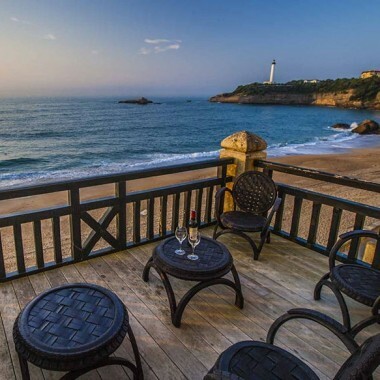 This villa in Biarritz boasts seven bedrooms, four of which have en-suite bathrooms. The master bedroom is like an apartment in itself—it has a huge bed, a spacious walk-in dressing room, an office, a lounge area, and a private deck that is almost the same size as the bedroom. The dramatic interplay of light in the room creates a space that is both sophisticated and inviting. In addition to the open-design kitchen in the main part of the villa, there is a separate kitchen near the back of the villa that is perfect for catering or a personal chef. It has three ovens, two professional-size refrigerators, and everything else you need to throw first-class parties. The villa also has a games room, home theatre, and a TV lounge that is separate from the formal living room. Amenities include air conditioning, heating, flat screen satellite TV, DVD player, in-home projector, stereo sound system and wi-fi internet. Living room. Dining room. Open-plan kitchen, very well equipped. Games room. TV lounge and home theatre. Master bedroom with king-size bed and en-suite bathroom with Italian shower, a bathtub, a separate WC, and a towel warmer. 4 double bedrooms with queen-size beds, 3 with en-suite bathroom. 1 twin bedroom and 1 single bedroom. Bathroom. 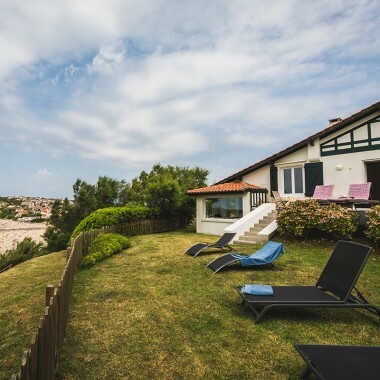 With its clean lines and bold furnishings, this ultra-modern, architect designed villa in Biarritz has it all! Luxuriously comfortable and incredibly spacious, it has the feel of a modern art gallery and is perfect for photo shoots, a wedding or anniversary celebration or corporate events. 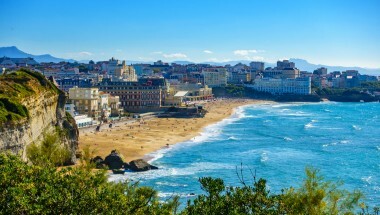 It sits in a wonderfully quiet, rural location, conveniently less than 10 minutes from downtown Biarritz, 5 kms from the beaches and just 1.5kms from the centre of Bidart.